Udupi/New Delhi, Aug 12, 2017 : A woman’s attempt to invoke her gender and distress that her property is up for grabs due to her confinement in jail failed to move Supreme Court to grant her bail in a case in which she is accused of killing her husband in the most barbaric manner in Udupi last year. She had burnt his body in a ’homakund” with the help of a priest, suspected to be his paramour, after embolising him through a chilly spray to poison him. A bench of Justices S A Bobde and L Nageswara did not allow the request to grant bail to 50-year-old Rajeshwari Shetty which was made by senior advocate Basava Prabhu Patil, after Karnataka police lawyer Joseph Aristotle contended the investigation was still on. Aristotle said a supplementary charge sheet will be filed soon against 26-year-old Niranjan Bhat, the priest. Patil sought bail for the woman, saying “the petitioner is woman and all the properties of the family are sought to be taken away by the people around.” He also questioned the prosecution claim of illicit relationship between the petitioner and Bhat as he was just 26-year-old old. Patil also submitted she has been in custody since August last year and the investigation with regard to her was over with the filing of the charge sheet. He even expressed readiness that the petitioner would stay away from Udupi district and remain either in Bengaluru or Mumbai, if enlarged on bail. Aristotle, on the contrary, submitted that this was an “extra-ordinary” case of “cold-blooded and barbaric” murder of a man by his wife. Her son is also in jail for the offence for being a co-accused. “Our fear is that she may tamper with evidence as most of the witnesses in the case are close relatives. The case is based on circumstantial evidence and further probe is on as her paramour Bhat has recently been arrested,” he said, opposing the bail plea. Court granted liberty to the petitioner to approach again after six months or if the investigation is over before it. 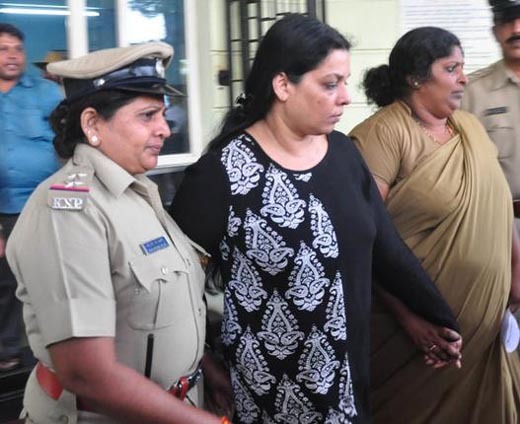 According to prosecution, Rajeshwari, along with her 20-year-old son, threw chilly powder into the eyes of her husband Bhasker Shetty and assulted him with rod. Thereafter, the accused tied victim’s hands and feet and administered poison to him. Later, they carried the body of the victim to the home of Bhat and burnt it by organising ’Yagna’. Further, to destroy the evidence, the bones and body parts were thrown in the river. The victim suspected fidelity of his wife and had lodged a police complaint on July 9 before his murder on July 28, last. The police acted on complaint filed by victim’s mother Gulabi as he went missing. The prosecution relied upon a DNA report to conclude the recovered body parts were son of the complainant.